Written by: Foreign Writers on April 12, 2019. Citizens of Europe, if I am taking the liberty of addressing you directly, it is not only in the name of the history and values that unite us, but because time is of the essence. A few weeks from now the European elections will be decisive for the future of our continent. Never since the Second World War has Europe been so essential. Yet never has Europe been in such danger. Brexit stands as the symbol of that. It symbolises the crisis of a Europe that has failed to respond to its peoples’ need for protection from the major shocks of the modern world. It also symbolises the European trap. The trap lies not in being part of the European Union; the trap is in the lie and the irresponsibility that can destroy it. Who told the British people the truth about their post-Brexit future? Who spoke to them about losing access to the EU market? Who mentioned the risks to peace in Ireland of restoring the border? Retreating into nationalism offers nothing; it is rejection without an alternative. And this is the trap that threatens the whole of Europe: the anger-mongers, backed by fake news, promise anything and everything. We have to stand firm, proud and lucid, in the face of this manipulation and say first of all what Europe is. It is a historic success: the reconciliation of a devastated continent is an unprecedented project of peace, prosperity and freedom. Let’s never forget that. And this project continues to protect us today. What country can act on its own in the face of aggressive strategies by the major powers? Who can claim to be sovereign, on their own, in the face of the digital giants? How would we resist the crises of financial capitalism without the euro, which is a force for the entire EU? Europe is also those thousands of projects daily that have changed the face of our regions: the school refurbished, the roads built, and the long-awaited arrival of high-speed internet access. This struggle is a daily commitment, because Europe, like peace, can never be taken for granted. I pursue it tirelessly on behalf of France, in order to take Europe forward and to defend its model. We have shown that things we were told were unattainable, the creation of a European defence capability and the protection of social rights, were in fact possible. Yet we need to do more and faster, because there is another trap: the trap of the status quo and resignation. 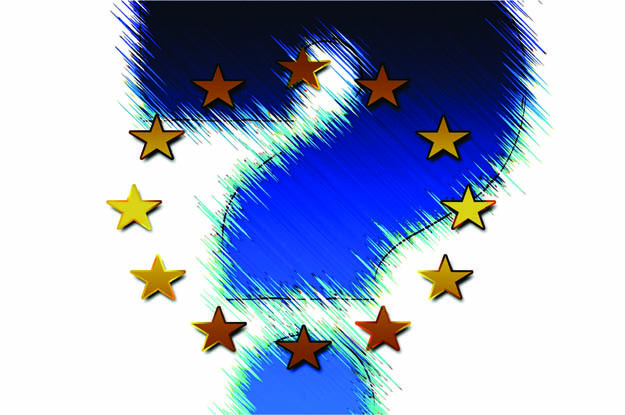 Faced with major crises in the world, citizens so often ask, “Where is Europe? What is Europe doing?” To them it has become a soulless market. Yet Europe is not just an economic market. It is a project. A market is useful, but it should not detract from the need for borders to protect values that unite. Nationalists are misguided when they claim to defend our identity by withdrawing from the EU, because it is European civilisation that unites, frees and protects us. But those who would change nothing are also misguided, because they deny the fear felt by our people, the doubts that undermine our democracies. We are at a pivotal moment for our continent, a moment when together we need to politically and culturally reinvent the shape of our civilisation in a changing world. Now is the time for a European renaissance. Hence, resisting the temptation of isolation and division, I propose we build this renewal together around three ambitions: freedom, protection and progress. The European model is based on freedom of people, diversity of opinions and creation. Our first freedom is democratic freedom: the freedom to choose our leaders as foreign powers seek to influence our votes at every election. I propose the creation of a European Agency for the Protection of Democracies to provide each EU member state with European experts to protect their election process against cyber-attacks and manipulation. In this same spirit of independence, we should also ban the funding of European political parties by foreign powers. We should have European rules banishing incitement to hatred and violence from the internet, since respect for the individual is the bedrock of our civilisation and our dignity. Founded on internal reconciliation, the EU has forgotten the realities of the world. Yet no community can create a sense of belonging if it does not have protected territorial limits. The boundary is freedom in security. We, therefore need to rethink the Schengen area: all those who want to be part of it should comply with obligations of responsibility (stringent border controls) and solidarity (a single asylum policy with common acceptance and refusal rules). We will need a common border force and a European asylum office, strict control obligations and European solidarity to which each country will contribute under the authority of a European Council for Internal Security. On migration, I believe in a Europe that protects both its values and its borders. The same standards should apply to defence. Substantial progress has been made in the last two years, but we need to set a clear course. A treaty on defence and security should define our fundamental obligations in association with Nato and our European allies: increased defence spending, a truly operational mutual defence clause, and a European security council, with the UK on board, to prepare our collective decisions. Our borders also need to guarantee fair competition. What country in the world would continue to trade with those who respect none of their rules? We cannot suffer in silence. We need to reform our competition policy and reshape our trade policy, penalising or banning businesses that compromise our strategic interests and fundamental values such as environmental standards, data protection and fair payment of taxes; and the adoption of European preference in strategic industries and our public procurement, as our American and Chinese competitors do. Europe is not a second-tier power. Europe in its entirety is a vanguard: it has always defined the standards of progress. In this, it needs to drive forward a project of convergence rather than competition: Europe, where social security was created, needs to introduce a social shield for all workers, guaranteeing the same pay for the same work, and an EU minimum wage, appropriate to each country, negotiated collectively every year. Getting back on track also means spearheading the environmental cause. Will we be able to look our children in the eye if we do not also clear our climate debt? The EU needs to set its target – zero carbon by 2050 and pesticides halved by 2025 – and adapt its policies accordingly with such measures as a European Climate Bank to finance the ecological transition, a European Food Safety Force to improve our food controls and, to counter the lobby threat, independent scientific assessment of substances hazardous to the environment and health. This imperative needs to guide all our action: from the Central Bank to the European Commission, from the European Budget to the Investment Plan for Europe, all our institutions need to have the climate as their mandate. Progress and freedom are about being able to live from one’s work: Europe needs to look ahead to create jobs. This is why it needs not only to regulate the digital giants by putting in place European supervision of the major digital platforms (prompt penalties for unfair competition, transparent algorithms, etc), but also to finance innovation by giving the new European Innovation Council a budget on a par with the United States in order to spearhead new technological breakthroughs such as artificial intelligence. A world-oriented Europe needs to look to Africa, with which we should enter into a covenant for the future, ambitiously and non-defensively supporting African development with investment, academic partnerships and education for girls. Freedom, protection and progress: we need to build European renewal on these pillars. We can’t let nationalists with no solutions exploit people’s anger. We can’t sleepwalk to a diminished Europe. We can’t remain in the routine of business as usual and wishful thinking. European humanism demands action. And everywhere, people are standing up to be part of that change. So, by the end of the year, let’s set up, with representatives of the EU institutions and the member states, a Conference for Europe in order to propose all the changes our political project needs, which is open even to amending the EU treaties. This Conference will need to engage with citizens’ panels, and hear from academics, business and worker representatives, as well as religious and spiritual leaders. It will define a roadmap for the EU that translates these key priorities into concrete actions. There will be disagreement, but is it better to have a static Europe or a Europe that advances, sometimes at different speeds, and that is open to all? In this Europe, the people will really take back control of their future. 2. Sweeping reforms to the passport-free Schengen area, including the creation of a joint border police force and European asylum office. 3. Stricter controls on the EU’s outer borders and a common asylum policy for migrants. 4. A similar approach to US President Donald Trump’s “America First” policies and a ban on companies that threaten European strategic interests. 5. Penalties or bans for companies that flout European rules — on environmental conservation, tax avoidance and data protection. 6. The creation of a European Climate Bank to finance the transition to a more sustainable way of life. 7. A “social shield” for all European workers with a European minimum wage adapted to each country. 9. Britain would once again find its place in Europe after Brexit. 10. A new European defence and security treaty to define the obligations of EU member states in coordination with NATO. This post has been seen 506 times.